Pope Francis clears John Paul II, John XXIII for sainthood | Fox News. Pope John Paul II was the pope of my childhood (though I was born under Paul VI), and was a great influence on me when I started attending Mass again after an absence in my youth (I never said I wasn’t Catholic, but I only attended occasionally in my late teenage years, and in my early 20’s). 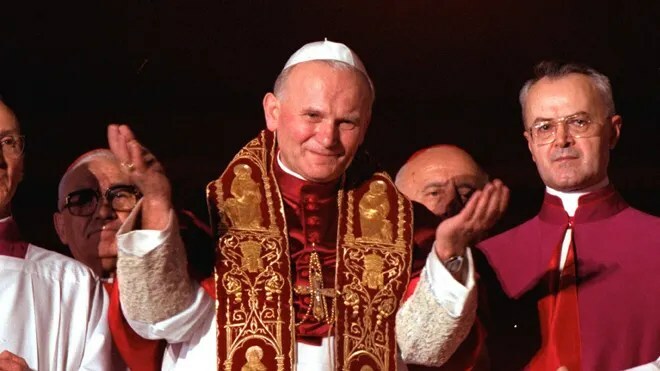 I always feel a bit off about the rush to canonize John Paul II, even though he was (and is) a role-model for me, and I do not doubt his holiness, his dedication to Jesus Christ and the Catholic Church. I guess I feel it is harder to be objective this close to when a person dies. I also feel a bit off about waving the requirements of a second miracle for Pope John XXIII. I guess just because it is a break from tradition, and I am a very traditional Catholic. Still, Pope Francis has the right to wave that requirement. So we will have two new saints, sometime in the near future – Pope John Paul II, and Pope John XXIII. December 8, the Feast of the Immaculate Conception, is being mentioned as a possible date for the canonizations. This entry was posted in Catholic, Culture, Religious and tagged Catholic, Catholic Church, Feast of the Immaculate Conception, Holy Father, John Paul II, John XXIII, Pope Francis, Pope John Paul II, Pope John XXIII, sainthood, saints. Bookmark the permalink.